Does Sewing Require a PhD in Math? 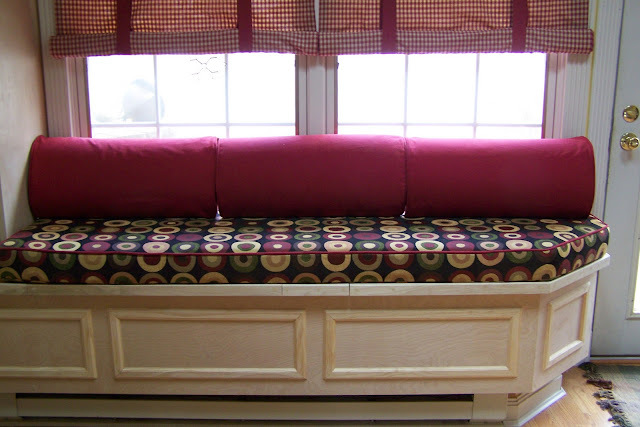 I recently tackled a window seat for an old friend. I was sure that I could meet her expectations, but it was nerve-wracking! Why? 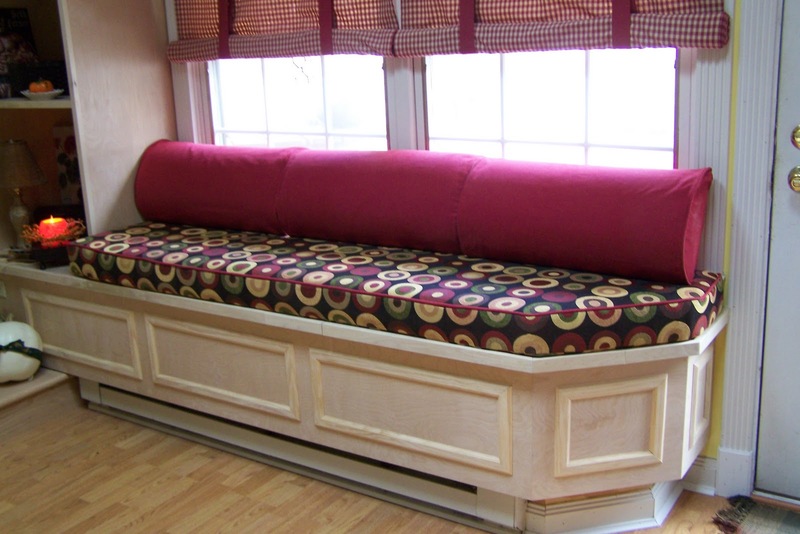 Because the window seat was a custom build and it was not a simple rectangle. You know I love to sew. I’m not a rocket scientist – I follow directions! It’s not that hard. And no, I don’t think you need a PhD in math to sew. However, you do NEED math. First, you need to know how to measure and calculate things like area and perimeter. Then you need to calculate your fabric needs. The employees at a place like Jo Ann’s are able to help you with this. In the case of this window seat, my client purchased the foam and the fabric. She also purchased Pottery Barn Bolsters that I recovered. 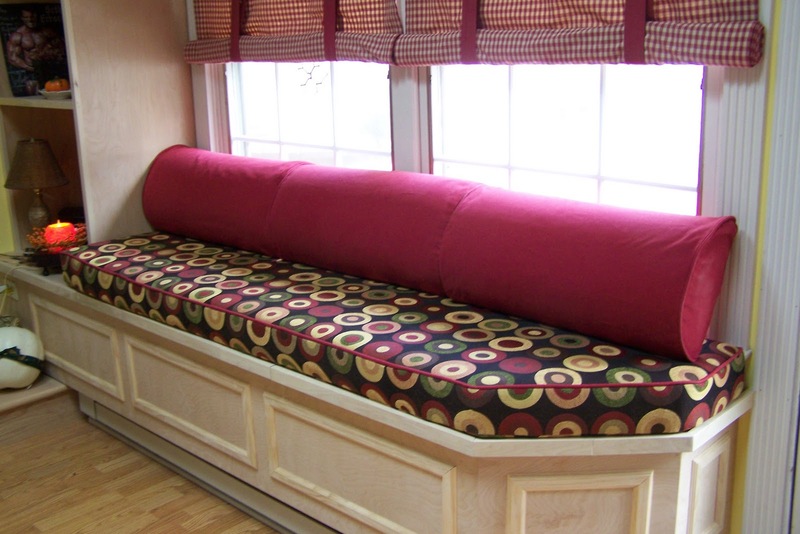 I measured the window seat and made a template of the corner. 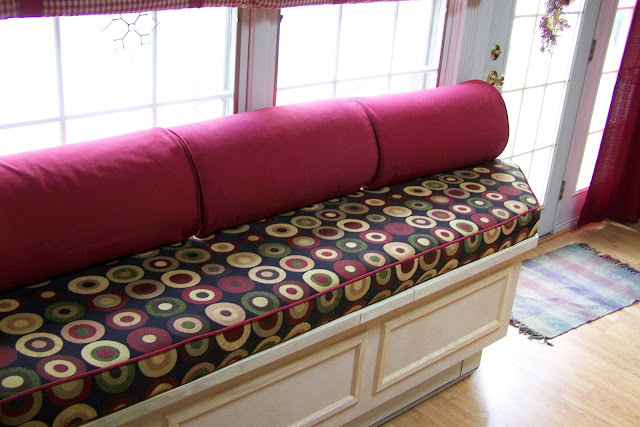 If you ever make a window seat with an unusual cut, it would probably be best to make a template of the entire seat, which then becomes the pattern for cutting the foam and fabric. The internet is a great resource for “How To’s”. 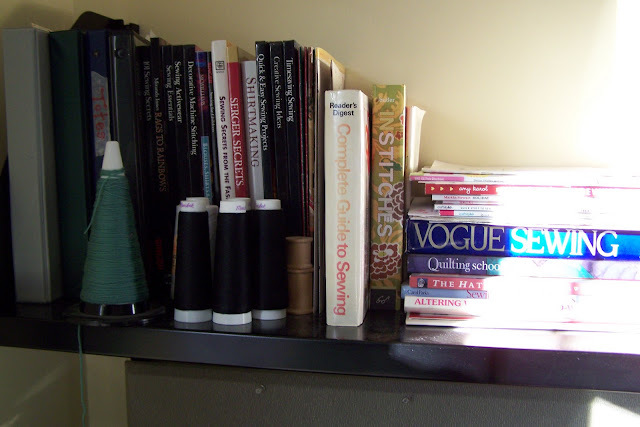 However, I still turn to my trusted sewing books to help me out with projects like these. I have purchased books at bookstores, second-hand bookstores, close-out stores and garage sales. The Singer series was a great bargain. 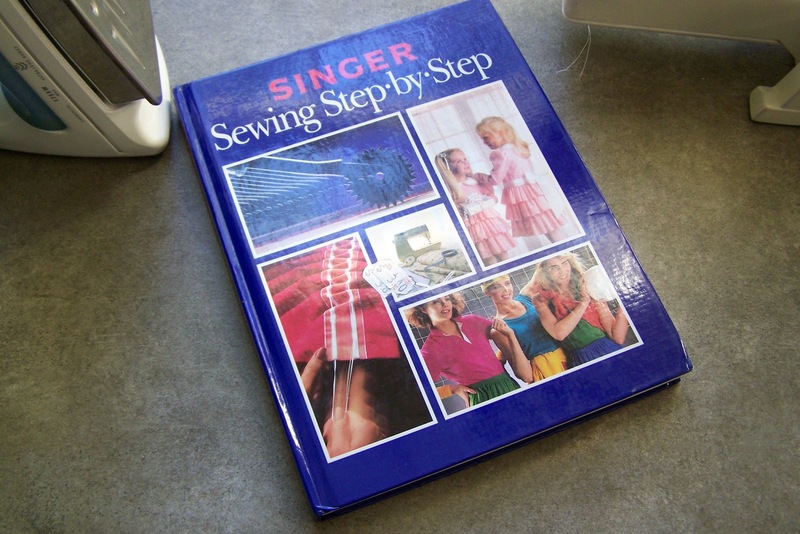 It has clear, step-by-step photos and sometimes it is easier to lay out a book than try to read a tutorial on the computer. But I still researched on the internet and decided that the foam cushion should be wrapped with some batting. The fabric and foam are cut to the exact measurements. 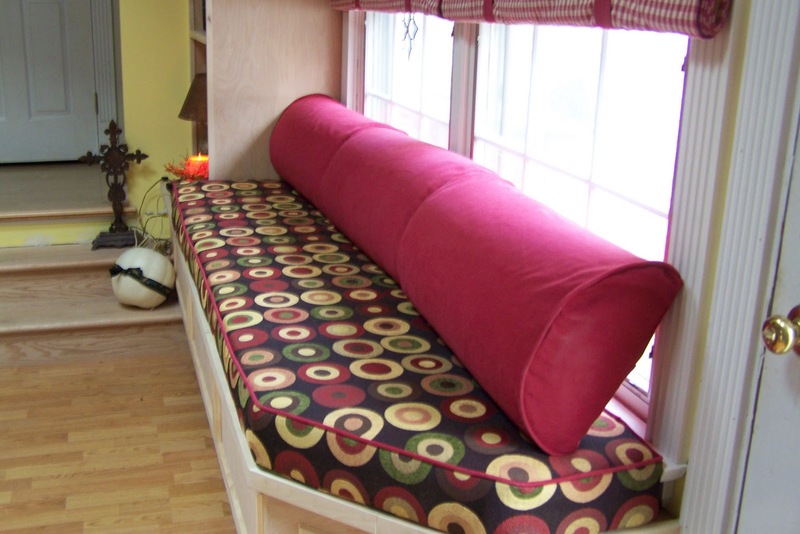 But adding the batting puts the cushion in a bit of tension, which helps minimize sliding and wrinkling. I made bias cording and also applied a 72″ zipper to the back. I measured the bolsters and created my own pattern. I also applied a snap tape to the back so they can be removed and cleaned as necessary. A project such as this can really add up. This particular foam piece cost over $40 on sale. Fabrics and notions are pricey as well. So you really have to be careful when you are cutting everything out. The fabric pattern, although mod circles, still had a linear component, so I had to ensure that everything lined up. the need for pencil and paper and those basic and sometimes not so basic math skills tends to pop up all over the place doesn’t it? It always makes my brain itch, but being able to figure out the numbers is satisfying too. Holy Schmoly! That looks really tough! I was going over my Christmas list when I remembered about you and your little blog… that’s when I went back and left you feedback on Etsy AND also ran into the little blog award you gave me in October. Thank you so much and I intend on “paying it forward” on Fri. Excited and thanks again, so very much for the sweet aprons. Wow that came out fantastic! 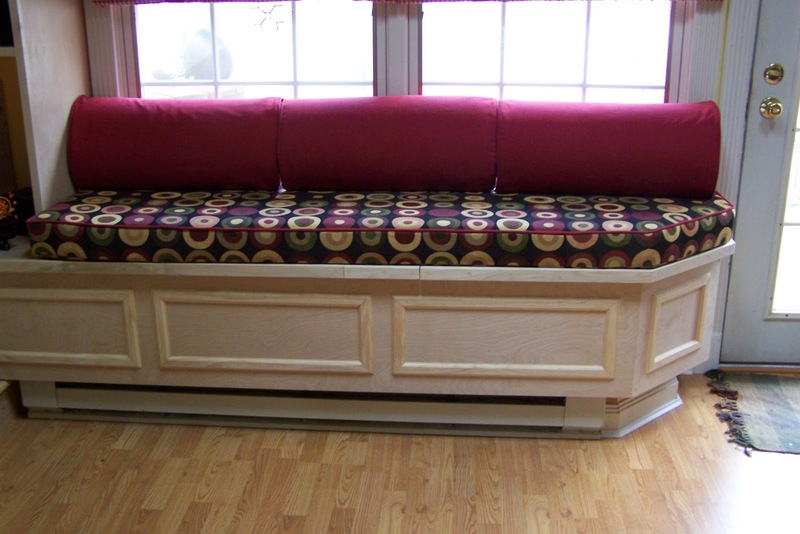 Great job Jane- I can’ imagine sewing something that complicated. Oh my gosh, that window seat is SO CUTE! I love the color and print choice. And the shape! I wish it was in my house! You did such a great job. The window seat looks so good– it’s so finished and professional-looking. I like the fabric very much. I have to admit, the math involved with sewing scares me a bit. But not as much as having to cut fabric to an exact measurement.